This is slightly reminiscent of Omniserve’s Google Rapid Inclusion ‘process’, but at £500STG this latest one sure aint cheap. To anyone who might be seriously interested in search engine registration I suggest you take a look at Free Search Engine Rapid Inclusion Service. Oh, and in case anyone (God knows who still reads any of my tripe…) is interested – this might be related to a certain Bord Failte Web Check Thread post I published a few days ago. as of today is number one for seo ireland, a site with zero content, page rank, and a handful of backlinks from one page sites which they themselves have little or no content, has google gone mad ? When I search for [seo ireland] my site appears at #1 (not something I;d usually check BTW). Maybe you’re logged into Google and getting personalised results? But if it did rank well then at a guess I’d say it’s down to the exact match domain name – Google often places exact match domains at #1 position as many search queries are navigational – people looking for a website. 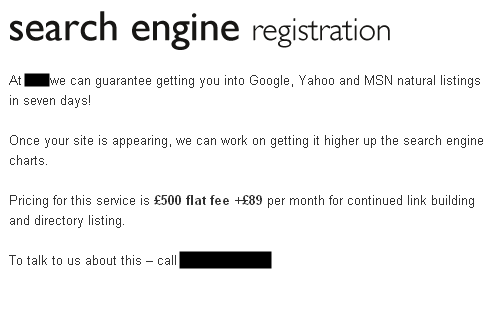 Its interesting to see who still offers search engine registration as part of their services. Although I would believe some sites simply havent been updated in a while. I’ve recently noticed seoireland.ie appear near the top results but I am also seeing your site Richard at #1 still. One thing I worry about, is Stephen from diy-seo.com. His site has been down for ages now (still ranks for [seo]), and even his email bounces. I do hope he’s alright. I noticed diy-seo had vanished. I was linking to him at one point but removed it after a couple of weeks of the site being down. I thought it belonged to someone on IWF – did you know Stephen? The problem with these ‘dodgy’ SEO companies is that they only need a handfull of punters to fall for the £500 to get you listed on google scam. As with most industries a handful of cowboys give everyone else a bad name.